The receptionists, porters, postroom workers and security guards whose workplace is the University of London have but one simple request. They want to have the same rights at work as those enjoyed by other UoL workers, including the right to bargain collectively with their de facto employer, the UoL. Yet this modest demand has set alarms ringing all he way up to the highest level of government and the law. Why? Because if this wins acceptance, it threatens to put a bomb under the whole racket by which 3.3 million outsourced workers are systematically cheated of their rights. The UoL protests that these workers are not employees of the Uni, because their jobs are outsourced to a facilities management firm called Cordant Security. Other workers doing similar jobs, but directly employed by the Uni, share the same workplace, eat in the same canteen and often do the same job. Yet Cordant employees get worse employment benefits than do their fellow workers, such as pensions and holiday entitlements. Fed up with this unfairness, Cordant workers turned to the IWGB (Independent Workers Union of Great Britain) for assistance in pressing their case. Alarmed, the Uni refused to recognise the IWGB, on the grounds that workers were free to join Unison if they wished. Undeterred, the IWGB went to court, pointing out that denying workers the right to be represented in collective bargaining by their union of choice was in contravention of article 11 of the European Convention on Human Rights. 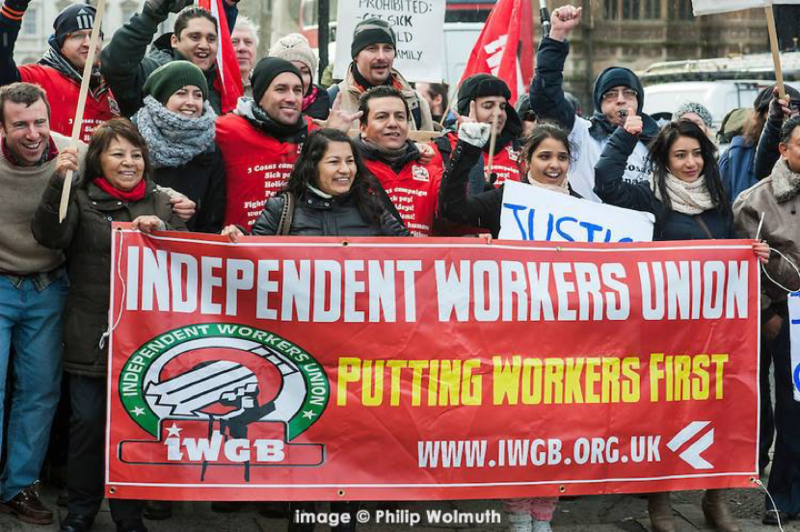 The Central Arbitration Committee (CAC) gave the union the thumbs down, but in a surprise development the High Court granted the IWGB permission for a judicial review of the CAC’s judgement. Now we have a curious spectacle. Suddenly all the agencies which have hitherto been at such pains to assert their splendid isolation from one another – the University of London, Cordant, the government – are all now ganging up together, running off to court to defend the outsourcing racket from attack. No matter that yesterday the Uni disclaimed any responsibility for Cordant workers and their problems (Not Me Guv). No matter that yesterday the government was happy to sit aloof and let the wheels of class justice roll over workers’ backs unimpeded. That was then; this is now, and hallowed academia, outsourcing hucksters and the Department of Business are all linking arms in common cause. The High Court, whilst granting the judicial review to the IWGB, will be allowing submissions from the CAC, the University of London, Cordant Security and the Department of Business as “interested parties”, each attended by a clutch of highly- paid lawyers. The IWGB and the outsourced workers of the UoL are clearly doing something right, judging from the degree of consternation their simple demand for a basic right is causing in the camp of the class enemy. Their struggle is beautifully exposing the inner workings of the capitalist state, and deserves the support of all workers.